I’m wondering how to get the featured image to remain as a vertical image when it is the top featured post (if that’s possilbe? ), as well as a previous post in Masonry mode. Right now, when I upload an image it gets cropped to the standard 3268 × 2178 but when i post above that, it changes orientation. What I really enjoy in your feed is how there are different vertical/horizontal orientations. I am having trouble accessing and mimicking that orientation. The featured images in single post view are always horizontal. However you can control which area of an uploaded picture is displayed in the horizontal cover. And which area is displayed in the grid. That’s what is done in the demo. You can see they all have different aspect ratios. What you might not know is that WordPress automatically generates all the sizes of an image used in the currently active theme once you upload an image. 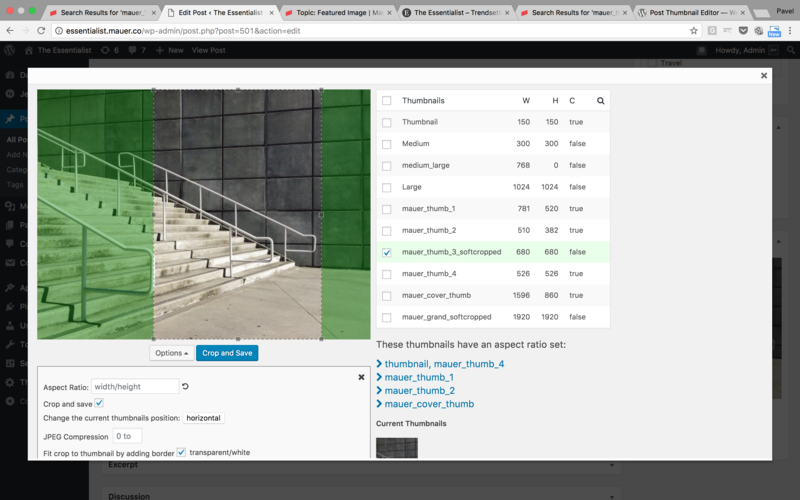 After that you can fine-tune each generated image with the Post Thumbnail Editor plugin. That’s what I did in the demo, including the above example with the staircase. To get a nice masonry grid I recommend, sticking with 2 or 3 aspect ratios (you can cut images preserving a certain aspect ratio — see the above screenshot), and alternate them. This is so incredibly helpful, thank you! !